BEEN THERE: Oct. 2, 2008, prior to a tour of the old Yankee Stadium with Brian Vangor. After many years of rumors, the New York Yankees front office announced in June 2005 that Yankee Stadium was going to be replaced. NYC Mayor Bloomberg, Governor Pataki, George Steinbrenner, and Steve Swindal were at the press conference. Personally, I was disappointed, because of my strong traditionalist leanings and because I thought they could have refurbished the existing structure in such a way as to rake in more revenue. I fully acknowledge, however, that the post-1976 Yankee Stadium lacked the authentic character of the pre-renovation original version, so perhaps it's just as well. In any case, groundbreaking ceremonies took place in August 2006, and construction was completed in time for Opening Day, on April 16, 2009. The architects who designed the new stadium were no doubt under huge pressure to make it look suitably grand, having "big shoes" to fill, metaphorically speaking. It is one of the few neoclassical stadiums whose design was not significantly influenced by the "retro" style pioneered by Oriole Park at Camden Yards. Like every other recent stadium since Citizens Bank Park, however, the new Yankee Stadium has a split upper deck, allowing concourse patrons to see at least part of the field. 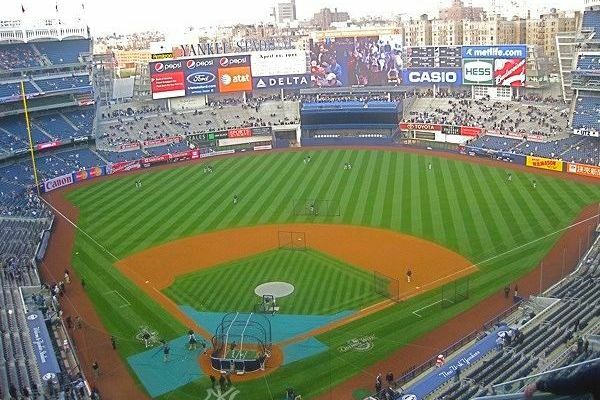 The new version consciously imitated several design elements of the old Yankee Stadium, especially the exterior, but also including the outfield dimensions. The outfield fences in the power alleys are perpendicular to the foul lines, however, making the distances to right center shorter than in the old stadium, contrary to what the Yankees front office claims. The extraordinary number of home runs hit there in April 2009 confirms my assessment. There will be pressure to rebuild at least part of the outfield fence, hence my proposed alternative redesign shown above, with longer dimensions from left center to right center field. Oddly, there is a fairly close correspondence in terms of outfield dimensions with the Metrodome, except for the left and right field corners. Getting an up-close look during the latter phase of construction did give me a better appreciation for the lengths they went to make the new stadium live up to its predecessor. The granite (?) exterior walls and the gilded "Yankee Stadium" lettering tell you right away this is a singular sporting venue, "in a league of its own." Together with the arched frieze that adorns the roof inside, these design elements hark back to the way the original Yankee Stadium looked. I was surprised that the new stadium is squeezed so tightly into the surrounding street grid. There are brick apartment buildings across the street not far from the third base side, and beyond the bleachers in right field are the same elevated train track as in the old Yankee Stadium. Keeping the Yankees in the same Bronx neighborhood where they have resided since 1923 ensures that the team will retain at least some of its championship identity for years to come, even as "the House that Ruth built" is demolished. "Yankee Stadium II" may fall short in terms of design uniqueness, but the more I study it, the more I appreciate its qualities. I will reserve final judgment, however, until I see it for myself! In the inaugural game on April 16, 2009, the home team lost to the Cleveland Indians, 10-2. The Yankees came back the next day and won, 6-5, as Derek Jeter and four other Yankees hit home runs. During the first two and a half months of the inaugural season, nearly twice as many home runs were hit in the New Yankee Stadium than in its predecessor last year. After a series of lame excuses from the Yankees front office, it became obvious to most people what anyone can see from the diagrams above -- that the distance to right center field is at least 15 feet less than before. The old annual tradition of a college football game between Notre Dame and Army was revived in New Yankee Stadium on November 20, 2010, and in late December the "Pinstripe Bowl" was inaugurated. Both of those special football events have been repeated each year since then. After the 2016 season, work began on removing several hundred obstructed-view bleacher benches beyond center field, and building new party decks in their place. There will also be new party decks seats in the 300 (Terrace) Level, but it is uncertain whether any existing seats will be removed. The 2017 diagram above reflects some of these changes, and is only preliminary. NOTE: The diagram thumbnails have been continually replaced since 2008, so the images seen in the older blog posts do not reflect how the full-size diagrams looked at that time. Roll your mouse over the adjacent thumbnail to see the original 2008 version.